On February 4th, the nation celebrated Transit Equity Day, in honor of the late Rosa Parks, who would’ve turned 106 years old. The holiday is intended to draw attention to transit as a civil rights issue and an important element of a climate-safe future. Across the nation, community groups and nonprofit organizations marked the holiday through a wide array of awareness-building activities, ranging from events by the Bus Riders Unite program in Portland, Oregon, which seeks the reinstatement of the Rider Advocate program to make the system safer for people of color who depend on it, to advocates in New Jersey pushing for the electrification of New Jersey’s transportation system. 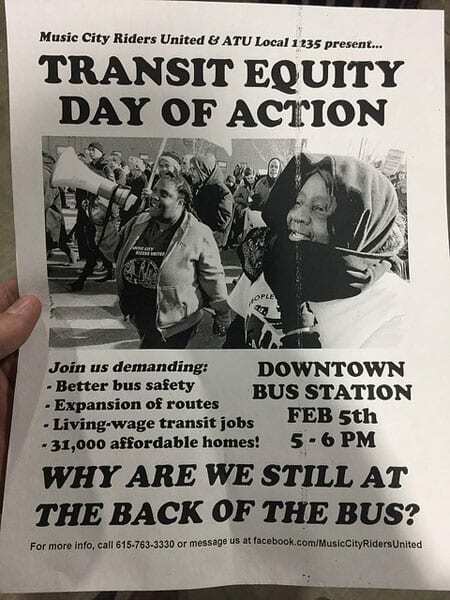 In Nashville, a group called Music City Riders United (MCRU) participated in public actions to demand transportation equity throughout the city, focusing on the discrepancy and placement of bus shelters throughout the city. MCRU is a campaign of Workers’ Dignity, a nonprofit dedicated to economic justice through organizing and developing solutions to wage theft and systemic abuse of workers throughout the greater Nashville area. For nonprofits addressing equity, the MCRU campaign shows how concerted public engagement and awareness can lead to transit equity progress. Accessible, affordable transportation is critical to the lives we live. Residents of communities of color and poor white communities, whether rural or urban, must travel to obtain better jobs, secure educational opportunities and get quality health care. Too often competing interests result in transportation policies that unintentionally leave low-income Americans stranded. To achieve equity in transportation policy, we need to craft and catalyze strategies that help rural and urban communities of color get the investments needed to spur mobility in every sense of the word. Today, transit equity is a central issue for many marginalized communities. As NPQ has written about before, effective public transit planning is important for ensuring affordable, accessible, and convenient transportation options that contribute to the well-being of many disenfranchised communities. Yet, there is a growing schism between communities with access to transportation and those without, which is reflected in accessibility and job proximity. While there are multiple reports that illustrate this growing gap, a 2015 report from Brookings entitled “The growing distance between people and jobs in metropolitan America” shows how this impacts low-income communities and neighborhoods of color. Sixty-one percent of high-poverty census tracts and 55 percent of neighborhoods with a majority of people of color experienced declines in job proximity between 2000 and 2012, meaning that these areas consequently had higher travel times to jobs. When combined with the realities of public transportation, which many low-income communities depend on, the picture illustrates why transit equity is so important: Urban areas offer higher-paying jobs but are inaccessible to many communities, with only 30 percent of urban jobs nationally being accessible via a 90-minute ride on public transportation, leaving many low-income communities without access to higher paying jobs because of limited transportation options. With this background, transit equity is a central issue for many economic justice organizations, including Workers’ Dignity and their MCRU campaign, as it represents a pathway to economic opportunity that is vital. The MCRU campaign is rooted in principles of equity, and utilizes public awareness campaigns, advocacy, and community organizing as key strategies to facilitate change. Recently, MCRU released its Bus Route Report Card: Nashville Bus Riders Highlight Key Transit Priorities, which is a compilation of grades by over 600 riders on 36 different routes of the Nashville’s WeGo public transit system. The report compiles responses based on 10 standards of quality public transportation and analyzes the results. The report found that the highest-rated bus routes based on safety, accessibility, convenience, reliability, and other measures are in predominantly white neighborhoods, while routes rated lower are in communities of color and low-income neighborhoods. In addition to raising awareness about the need for public transit investments, through its community organizing efforts, MCRU has gained several substantial victories to improve the public transit system and address transit equity. These victories include the institution of free bus transfers (saving each rider about $540 monthly); expanded hours on nights and weekends for routes; reduced bus fares across the board; eliminating the 24-hour reservation requirement for AccessRide, which serves many disabled riders; and the inclusion of a bill pay kiosk after the public transit system cut bus service to the Nashville Electric Service. While these accomplishments are to be lauded, more transformational changes are needed, ones that require major public investment. One issue is that public transit improvements and initiatives are funded through ballot measures, which often pit voters who rely on public transit against voters that don’t use it as often. And the scope of these measures is incredible. According to the Eno Center for Transportation, which houses a database of all transportation ballot measures, in the 2018 fall election cycle, there were over 250 transportation measures in 25 states, amounting to a potential $55 billion investment in transportation. Nashville was one of the cities with a measure, which failed by a 2-to-1 margin. The measure sought sweeping changes to the transit plan, along with an investment of more than $5 billion. MCRU and Workers’ Dignity launched the People’s Alliance for Transit, Housing, and Employment (PATHE) in conjunction with Nashville’s transit measure to advocate that community benefits agreements and considerations were included in the plan. Duke University objects to the building of a light rail line, claiming that construction vibration and electromagnetic interference from the trains could disrupt research.